Terry S purling enjoyed amazing success as a player and coach. And now he’s a big fan. Especially of his grandchildren — Houlton player Kolleen Bouchard and her brother, former Shiretowner and current Bentley College player Kyle Bouchard. Spurling was a member of the Bangor Daily News’ first All-Maine Schoolboy Basketball Team in 1956. He helped lead the Ellsworth Eagles to Class L State Championships in 1953 and 1954 and to the New England Championships. The 1954 Ellsworth squad, which lost 54-53 to Hillhouse of Connecticut in the semifinal round at the Boston Garden, is in both the New England Basketball Hall of Fame and the Maine Basketball Hall of Fame. Spurling, who says Ellsworth coach Charlie Katsiaficas was an important role model, told the Bangor Daily News there have been a lot of changes in the 60 or so years since he played ball. “We played in old barns, we shoveled the yard [and played], you don’t see that anymore,” he said. After his stellar career at Ellsworth, Spurling lettered for two seasons at the University of Maine — 1957-58 and 1958-59. 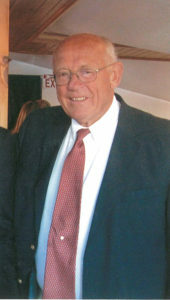 Spurling taught and coached at Aroostook Central Institute and taught, coached and was athletic director at Houlton. He lives in Houlton and Florida.